Right, nearly back on track again. Those of you who know me will gasp in apprehension and reach for the telephone when I tell you that I took some time off work! I realise this is disaapointing to those of you who thought that I slept in my book basement beneath a sheet woven from pages of disbound incunables, with my head resting on sheets salvaged from the Roman de la Rose. That’s just the occasional Saturday. As a result of this part III of my ramble has been delayed, and the man who prints our catalogues is staring in baffled, cigar chewing rage at his empty printing presses and grumbling workers angrily waving their flat caps, jamming their thumbs into their waistcoat pockets and generally threatening either to release their whippets or sing a song about the Peterloo Massacre. I on the other hand have been revelling in at least one uninterrupted night of sleep, the occasional furtive and unseemly bout of exercise and perfecting my omelette recipe. I’ve also explored the area that I live in, and discovered a lot of it is rather nice, in addition to using a variety of nefarious methods to attract bees to my back garden…for those of you interested; very tiny sacrificial altars…all I’m saying. I have become some sort of hobbit, this one day…I may have had more than one breakfast. I kid you not. 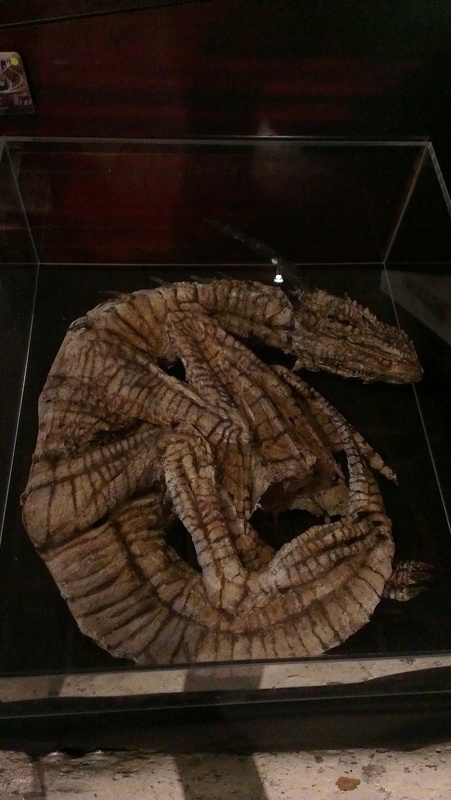 Whilst we’re on the subject of sacrificial altars I promised a few of you I’d give a quick run down of my visit to Alex CF’s show of the Merrylin Cryptid Collection, “Fringe Zoology” at the Old Operating Theatre and Herb Garret in London Bridge. It’s off topic I realise, but I’ll be back on books in a couple of days. Promise. Normally any review written by me would consist of: “I went to….it was awesome/rubbish…I would/would not go again.” Philip French I am not. On this particular occasion however I’m going to wax all effusive. This is an Operating Theatre, and it is old. “In 2006 a trust was set up to analyse and collate the contents of a huge number of wooden crates found sealed in the basement of a London townhouse that was due to be demolished. Seemingly untouched sine the 1940’s the crates contained over 5000 specimens of flaura and fauna, collected, dissected and preserved by many forgotten, professors and explorers of obscure cultures and species. The collection also housed many artefacts of curious origin, fragments of civilisations that once ruled the earth, of ideas and belief systems best left in the past. There’s a lot of art in London. This is a good thing. Not all of it is good art I’m sure, I don’t actually know what that consists of (I’m also reasonably certain that nobody else does either, seeing as fricking “Apocalypse Now” still keeps ending up in the top five greatest movies ever made lists). I don’t go to much of it…not because it isn’t good, but because I am grumpy and stubborn and unsightly and there are very few venues I have attended where after ten minutes the urge to steal the booze and lock the artist in a broom cupboard crammed with ravenous disease weasels hasn’t become uncontrollable. I’m so antiquated that the mere fact that rooms aren’t rooms any more…they are spaces…is enough to make me go all Mr. Hyde and rush out to purge Hackney of people who use the word “confrontational” to describe spray painted furniture. But’s that’s just me, I’m horrid, and nobody likes me. Something else horrid that nobody likes. Alex CF is nice however, in fact I think he’s probably not just nice, he’s probably borderline adorable. For a man who spends his time pondering the niceties of recreating pseudo-Victorian, Lovecraft inspired cryptozoological autopsies in a bewildering variety of mediums, he seems rather cuddly. I imagine him up to his elbows in eldritch ichor humming along to cheery music-hall ditties whilst preserving one of the few surviving shrunken heads salvaged from the Rigg-Hanratty expedition to the Lost Plateau of Leng in 1922. A quick chat while stumbling around the Old Operating Theatre trying not to break anything revealed the facts that there are a disturbing number of people who ask him for permission to test the DNA of his demon corpses, and that the high point of his last exhibition was a protracted conversation with two small children who wished to discuss the finer points of the transmission of Lycanthropy…apparently they were very well informed, and presumably conducting research of their own. Who knew Hogwarts did field trips? Apart from the fact that he’s very pleasant and clearly very talented, (the draftsmanship alone is of notable quality, even apart from the obvious creative verve he’s technically splendid) there’s a reason I’m going on about him, and others like him. Bibliodeviant’s Special Unified Cultural Theory states quite clearly that we are trained and conditioned from a very early age to carefully assess and differentiate between what is real, and what is not real…then, at the first possible opportunity we hurl away our carefully nurtured definitions and leap recklessly into the perceived unreal with the gleeful abandon of cinematically attractive people going skinny dipping. It is one of the single most important aspects of what we call humanity; the quality of being unable to touch, smell, taste or otherwise meaningfully quantify an experience yet freely and willingly accepting its immense and immutable significance in what we think of as our lives. This is what we do every time we fall in love for example, everytime we awake from a dream with the answer to a question that has been occupying our every waking hour, it is what we do when we go to church, it is also why our libraries and museums so frequently look like places of worship, and are often designed by the same people. It is what we do when we look at a clock, when we look at a baby and subconsciously start imprinting our aspirations and expectations upon it (that always turns out great) and it is why we are capable of looking at ink on a page and paint on a canvas and each and every one of us seeing and feeling something different. Culturally there are few archetypes as valuable as those who facilitate our myriad and diverse leaps of faith and desire. Those who blur the borders between our everyday lives and our everyday dreams (or in Alex CF’s case, opium based hallucinations) are especially important. In my opinion obviously. But I’m biased, I get a giddy sense of joy everytime someone photoshops the Tardis into the background of a Victorian parade, converts their spare room into the bridge of the Enterprise or Sherlock Holmes’s study, or indeed stuffs the walls of their house with books; which is an intimately related past-time. 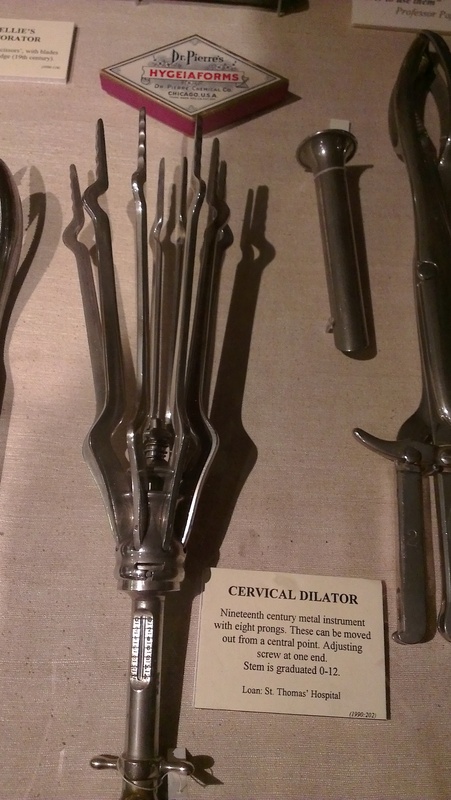 You can tell it’s a related field because that’s me, with a book, and obstetrics tools (all of which clearly designed by men)…and they don’t let me out unless there’s something unseemly and old involved. 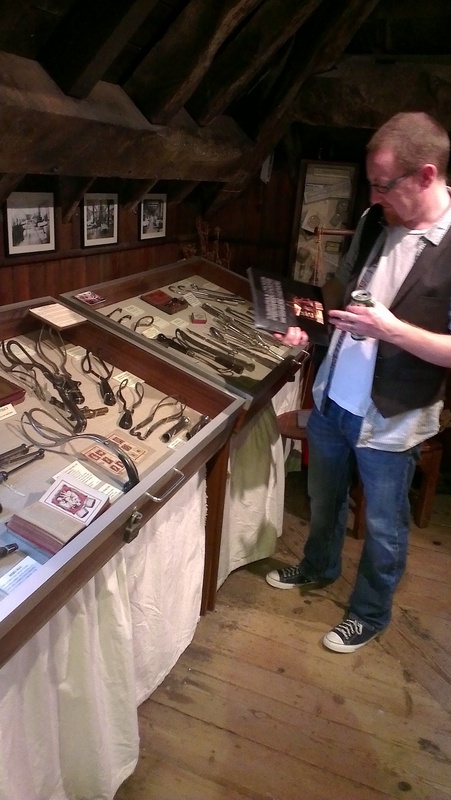 The Old Operating Theatre, for those who haven’t been there, is a treasure trove of antiquated medical curios, equipment, tools, recipes, paraphenalia and faradiddles. Herbs in bunches dangle from the wooden beams that just barely hold up the ceiling, there’s a rather judgmental skeleton in a case, a huge rack of poisons and enough orifice-expanding steel and ironwork to make you never, ever want to visit a medical practitioner again. Combine this already heady and fragrant melange with a dragon’s head, mummified faeries, half a vampire corpse and Bob is not only your Uncle; he’s also apparently possessed, undead and sticky. One of Alex CF’s major fears, other than the ones involving peasants with torches and pitchforks led by the Witch-Finder General, was that having an exhibition of his works in a venue like this might leave people unsure which bits were from him and which were just regular, bog standard grotesque. As far as I’m concerned, part of the charm of a visit to this show is just that; the difference between a salvaged vampire hunting kit and a 19th century surgeon’s instrument case is one that takes a moment or two to work out. I left happier. If I were wealthy as well as overly-verbose, I’d buy lots of his stuff and fill my house with it. His show is on until September 1st, you should go, details are here. 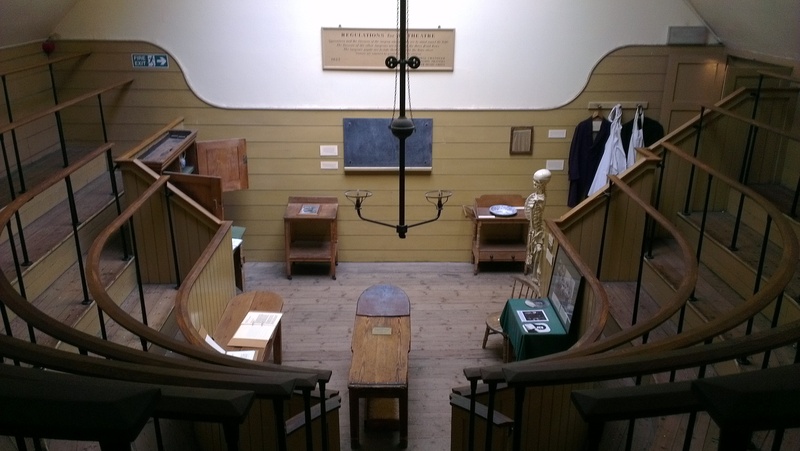 The Old Operating Theatre is there all the time, you should go, details are here. ok, that’s enough of me doing my bit for impoverished necromancers. Next up; Book of The Week and The best lack All Conviction part III.